STS-121 mission specialist Piers Sellers exits the International Space Station (ISS) during the first of three spacewalks planned for his mission aboard Discovery. HOUSTON - Two shuttle astronauts wentthrough the motions of an orbiter heat shield repair while perched at the endof an extra-long robotic arm during a Saturday spacewalk outside the InternationalSpace Station (ISS). NASA astronautsPiers Sellers and Michael Fossum spent most of their mission's first spacewalkat the tip of their Discovery shuttle's 100-foot (30-meter) robotic appendageto determine its stability for the delicate work that would be required to fixa damaged orbiter heat shield. "My firstimpression is that it damped out a lot faster than I thought it would," Sellerssaid of the extended arm's movements after the tests were completed. Sellers andFossum each spent time bouncing on the end of Discovery's 50-foot (15-meter)inspection boom, which itself was perched at the tip of the orbiter's 50-foot(15-meter) robotic arm. They leaned back and forth, performed typical spacewalkactivities - such as grabbing a camera or reaching for tools - then moved closethe main truss of the ISS for some mock shuttle tile and wing panel repairs. "It'slike being at the end of a fishing rod, isn't it," Sellers told Fossum duringthe tests. "Ain't that the truth," Fossumreplied. Fossumperformed much of the mock shuttle repair work and used a special strain gaugeto measure the force he applied to the station's surface. Some movements went surprisingeasy, while others required extra effort and concentration to perform. "Okay,moving in...you've got to let your body go out...this would take some practice,"Fossum said while performing a mock shuttle wing leading edge repair, addingthat he had to lift his toes inside his spacesuit just to compensate for theorbital boom's motion. Discovery'sSTS-121 mission is NASA's second shuttle test flight since the 2003 Columbia accident. Today'sseven-hour spacewalk, which began at 9:17 a.m. EDT (1317 GMT) as the spacestation flew over Asia, is the first of two extravehicularactivities (EVAs) directly aimed at testing orbiter heat shield repairmethods. Additional repair techniques will be tested during the flight's thirdspacewalk currently set for Wednesday. NASAdeveloped Discovery's orbital inspection boom in direct response to the Columbia tragedy, in which heat shield damage led to the loss of one orbiter and sevenastronauts. The boom has been used on two missions - Discovery's STS-114 flight in 2005 and the currentSTS-121 spaceflight - to scanthe shuttle's heat shield for damage. Engineerson Earth will pore over the results of today's tests to determine just howeffective Discovery's orbital inspection boom can be as a work station. TonyCeccacci, lead shuttle flight director for Discovery's STS-121 spaceflight,said Friday that today's tests would help engineers decide whether repairs canbe staged from the boom as is, or whether a specialized workstation would haveto be developed to attach to its tip. 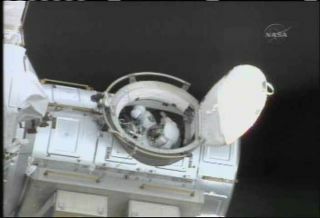 Sellers andFossum appear to have breezed through their first task in today's spacewalk: puttingthe mobility back into the space station's railcar-like Mobile Transporter. Less thanone hour into their spacewalk, the astronauts installed a blade blocker into a cablecutter system on the top - or zenith - side of the Mobile Transporter. Thefix will prevent a guillotine-like blade from inadvertently slicing a power,video and data cable as the Mobile Transporter moves along the station's maintruss. A similarcutter system on the bottom - or Earth-facing, nadir - side of the MobileTransporter inexplicably fired on Dec. 16, 2005, and severed a backup cable. An attemptby the space station's previous crew to safeguard the remaining cable from thesame glitch failedwhen Expedition12 commander BillMcArthur was unable to drive a safing bolt into the mechanism during aFebruary 2006 spacewalk. He and then-station flight engineer ValeryTokarev removed the cable from the cutting system entirely to be safe, butthe fix effectively immobilized the Mobile Transporter. The Mobile Transporteris a vital piece of ISS hardware because it serves as moving base for thestation's robotic arm and a carrier for large pieces of hardware, such as a newsolar array tower slated to be delivered to the orbital laboratory in lateAugust. WithSellers and Fossum's Saturday repair, the Mobile Transporter can now be moved intoposition for the next STS-121 spacewalk - set for Monday - when the twoastronauts will replace the railcar's baby grand-piano-sized Trailing UmbilicalSystem (TUS). It was the TUSsystem's cable that was severed in the Dec. 16 glitch. Replacing it willadd full redundancy to the Mobile Transporter and pave the way for later spacestation construction. "Hey there'sthe TUS," Fossum said as the initial Mobile Transporter repair was completed. "We'llsee you again another day." Today's spacewalkwas the fourth EVA for Sellers and the first for Fossum, who is also making hisfirst spaceflight with Discovery's STS-121 mission. "There's alarge planet below me, so that's good," said Sellers, who later saw hishomeland, England, and Ireland pass beneath his spacesuit-clad boots. "Oh mygoodness, it's a beautiful day in Ireland." By thenumbers, today's spacewalk marked the 66th EVA in support of thespace station and the 19th staged from its Quest airlock. "God, thisis a mind-blowing trip," Fossum said of the spacewalk.